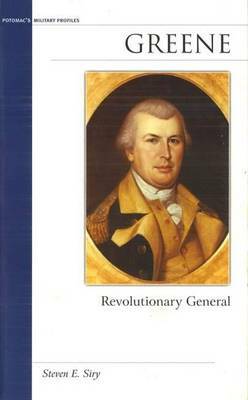 Born into a Quaker family, Nathanael Greene had nothing in his background that pointed to a military career. His total military training before mid-1775, when he abandoned pacifism, consisted of serving as a private in the Rhode Island militia for a few hours each week. Yet, no doubt because of his leadership ability, the Rhode Island Assembly in May 1775 appointed Greene commander of the Rhode Island Army of Observation at the siege of Boston. In June, at age thirty-two, Greene became the youngest general in the Continental Army and the only general who had never held a military commission. When the Revolutionary War ended eight years later, he was the only one of George Washington's generals who had served continuously from its start. Resourceful and courageous, Greene combined common sense, a keen intellect, fine organizational skills, and a remarkable aptitude for using topographical and geographical information. Indeed, he became Washington's most trusted adviser and eventually ranked second in the command structure of the Continental Army. After distinguishing himself in the northern campaign and providing invaluable service as quartermaster general, Greene became commander of the Southern Department with orders to rebuild its forces following devastating losses in South Carolina in 1780. With Georgia and South Carolina under British control and North Carolina and Virginia threatened by invasion, the situation seemed hopeless. Greene, however, combined regulars, militia, and guerrillas into a force that used rapid movement and continuous pressure against the British, outmaneuvering and outguessing them. By 1782, British forces were restricted to just two Southern seaports. With his understanding of unconventional warfare, Greene thus played a significant role in undoing Great Britain's power in North America during the War for Independence.